Imprisoned for five years for a crime she didn’t commit, Alexandra DeMonaco (Elizabeth Lackey – NYPD Blue, Medium) was the innocent victim of her husband’s medical insurance scam. She was the scapegoat who suffered behind bars; he was the scam artist who walked away with $5 million dollars… and their daughter. Despite her captivity, Alex chose not to dwell in self pity. Rather she was driven by the strength of mind that she could one day find her daughter. While incarcerated, Alex studied the ins and outs of the judicial system, earned her law degree, and vowed that she would seek retribution on her husband by becoming a lawyer. But, as a convicted felon, Alex cannot legally practice law. Now on parole armed with determination, Alex lands a job as an assistant to highly respected civil lawyer Hamilton Whitney III. (Richard Thomas – The Waltons) With his help, she uses her new skills to champion underdog cases, clear her name, and begin the search for her missing daughter, Mia. Having experienced her own clash with the legal system, Alex uses the law to help those who have been abandoned by the system. But her sassy, brash personality bumps hard against Whitney’s reserved intensity and Harvard education. Even though she keeps bringing in hard luck cases from former inmates which he would otherwise avoid, Alex’s quest for justice soon re-ignites Whitney’s passion for the law. Alex proves that she has a remarkable gift for uncovering the truth and bringing criminals to justice. Filled with suspense, mystery, true grit, and good humour, Alex DeMonaco’s drive to fight and win justice will make television audiences want to stand up and cheer. 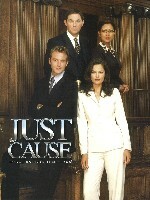 Just Cause also stars Shaun Benson (General Hospital, K-19:The Widowmaker) as associate lawyer patrick Heller. Created by Jacqueline Zambrano (Gabriel’s Fire and Under Suspicion) and Gail Morgan Hickman (The Sentinel and The Enforcer). Produced by Minds Eye Entertainment. Just Cause has been commissioned by PAX Network in the USA and The W Network in Canada. Just Cause is 22 one-hour episodes with a 90 minute pilot MOW available as well.